This is the final update to Eminence. If you find any bugs, please let me know. Eminence won 1st place in the 9th Challenge at Skinning.net. Looks like you got it fixed. Opera and Outlook both have menus. I like this skin. I also like your wallpaper. Where'd you find it? How about a better link to the wall. Like the WB. Already had it for a while, but DLed this one cause you said you changed some stuff. Will it work with 4.6 or only 5.0?? I would like to make a compact menu, but I don't want to bloat the file size of the .wba. How can I create a subversion without creating two copies of all the images? Every time I try to do this through Skinstudio, both versions change in sync. Example: I make the start menu compact in the subversion that I added, and the start menu in the original changes also. Oh and I am glad that some of you like it. If there are any who dislike something about it, other than the overall style, let me know. Really nice and only thing I would change is the color of the buttons in the places items and program items. The color for the all programs and other menus is great. Good work and a very good improvement~! A very very nice looking, smooth theme. I must give it an 8. The ONLY reason it isn't a 10 is because of a few minor things not done. 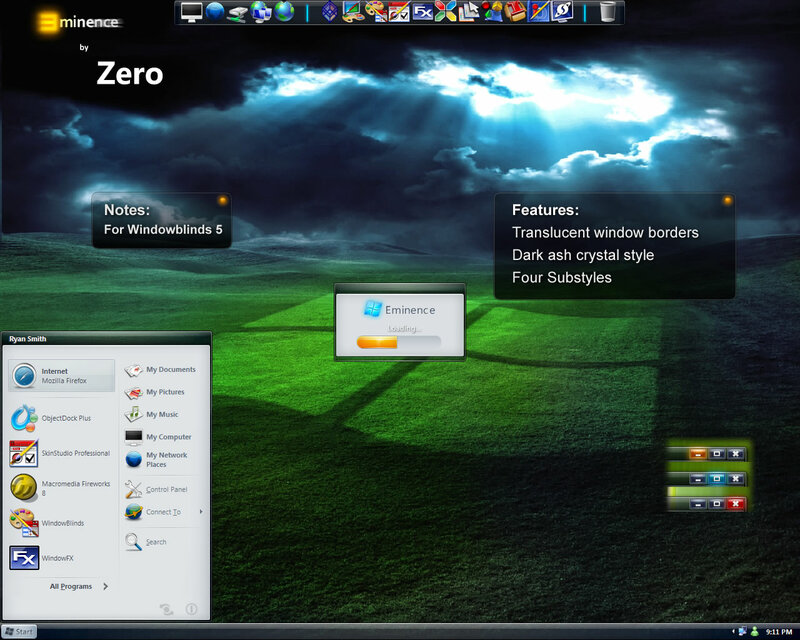 XP Shell section, Special Pane Content, Background Images (My Music, My Pictures etc..) and Toolbar Icons and animations. Those items aren't necessary though. You still did a fantastic job. Ok Phoon, I wasn't going to include those things, but you have inspired me. What is the best software for doing animations, such as these? Icons are coming and so are bg images. Animations, well it depends if I can find suitable software. Thanks, and Shelby, I will experiment with an orange/blue for the hot states on the start menu as you advised. I've never had the inclination to do those myself yet either. There are many good resources available here though. Try posting a new thread about that, or searching though the forums. Very nice clean and functional skin. I really like the color combinations you used; easy on the eyes. I would echo phoon's one comment that a set of complementary Toolbar icons would have put it over the top. Thanks for sharing. Very nice indeed. I love skins with small or thin taskbars so this one is a keeper. I especially love the clean start menu where 'all programs' is highlighted. I've seen so many skins that looked perfect in the screen shot, only to download it and find that the all programs area is off kilter.... Couldn't tell you how many skins I've deleted because of that. And you've mastered that by only your second submisssion.... Bravo! Looking forward to seeing more skins from you. Excellent work! Thanks, I just finished some icons and now I am going to work on some bg's! Hopefully by tomorrow I can update it. If you are curious about the icons, download the updated version when I upload it. Your words of encouragement mean a lot to me. BTW: Is it a general consensus that the start menu hot state should be bright colored (orange/blue) rather than the bluish gray? Or do you prefer it the way it is? Very very nice, Slim Shady would definitely approve. I wouldn't make it orange/blue, just keep it the way it is. You might want to give it some blueish gray highlights...But I am really happy the way it is. If you decide to go with the brighter stuff than make it as a sub style!